The summer heat is reaching a scorching apex: Great sections of the American West, including the area just beyond Yosemite National Park, are enveloped in wildfires. Daily temperature records are being broken in the United Kingdom, Canada, Japan, and beyond. 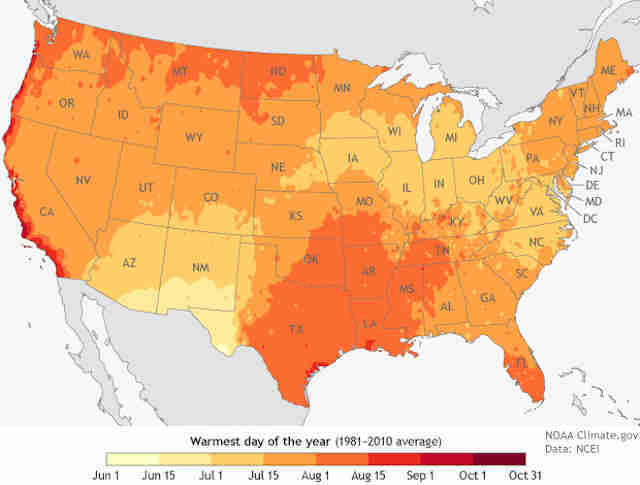 Luckily for you, though, the hottest day of the year will likely have passed by the end of July, as a new map developed with data from the National Centers for Environmental Information shows the warmest day of the year across the entire United States. This literal heat map shows what's expected to be the hottest day of the year based on the National Oceanic and Atmospheric Administration's climate normals, or climate data collected between 1981-2010 in the US. As NOAA explains: "The colors show date ranges progressing from June 1 (lightest yellow) through September 30 (darkest red). The darker the color, the later in the year the hottest day typically arrives." 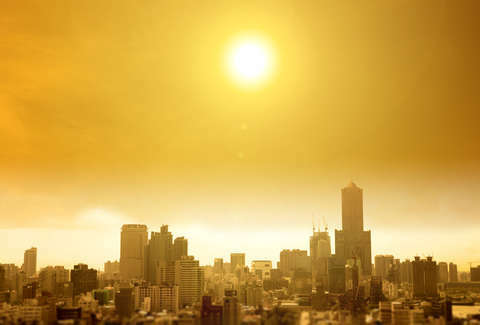 You'll see that most of the country suffers through the brunt of summer in mid-July through mid-August, but that hellish month comes earlier for some parts of Texas, Arizona, and New Mexico, which typically see their hottest days in June. The Summer Solstice, which occurred on June 21, typically traps the most solar radiation of any day throughout the year, although it doesn't typically wind up being the hottest. States that heat up earlier are affected by the North American Monsoon, which brings rain and cooler temperatures later in the summer, per NOAA. States that get hotter later in the summer, and occasionally see their hottest days stretch into September and even October, owe their delayed plight to the marine layer, which keeps things cool in the earlier stages of summer. The Pacific coastline can probably expect a latent heatwave, if this year's summer mirrors the map's climate modeling. While there's no way to know if the map will serve as an exact reference point for your summer, the historical data at least provides some kind of guidepost.